The Provo Rooftop Concert Series is moving a few dozen yards south, and 20 feet closer to the Earth. The series' original location, the rooftop of the downtown Marriott parking structure, didn't allow for much growth. Only so many fans could fit on the two open-air levels, and although food trucks lined the street surrounding the venue, space was fairly limited. 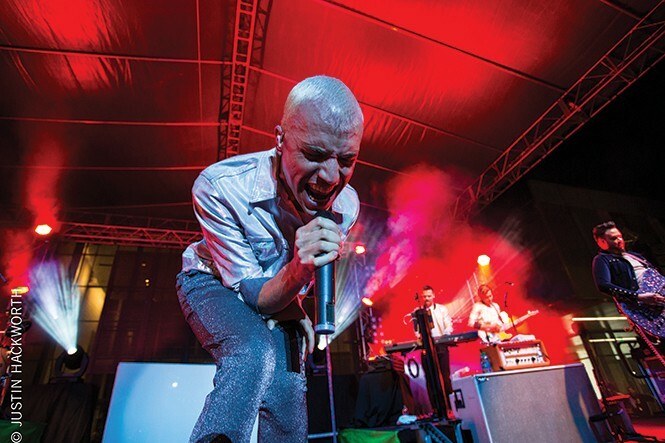 The new venue on Center Street in front of the Nu Skin headquarters (where Neon Trees performed last October) means more fans can attend, and more food trucks can park on the fringes. The concerts remain free, and will still happen on the first Friday of the month, May through September. Series organizers, blogger C. Jane Kendrick, photographer Justin Hackworth, musician Mindy Gledhill and Provo native Sarah Wiley, in partnership with the Provo City government, are faced with a new set of challenges with the move. One is working out the logistics of both a new venue and a new stage, which will be set up in the middle of Center Street downtown and, consequently, must be broken down after each concert. Another is explaining to people why they're keeping the name when the bands won't be performing on the rooftop anymore (fans can still watch from the rooftop, half a block away). The decision was made in an effort to stick to their roots; even with the shakeup, the Rooftop series has a specific feel (with alums like The National Parks, The Moth & The Flame, The Strike and Cory Mon), which they intend to maintain. The series is intended to bring attention to Provo's downtown and, along with it, highlight local food trucks and restaurants, while promoting and supporting Provo's music and art scene. Eclectic Provo artist Steve Vistaunet will design the concert posters this summer. Joshua James, American Fork singer/songwriter, is headlining the first concert in the series on June 5. It's fitting—he has been involved in producing albums for other Utah County artists like Desert Noises, Isaac Russell and Blue Aces; he has also promoted local music with his own Fork Fest (in 2010). It's the third time James will have headlined Rooftop in its six-year run, because concert organizers wanted someone "dynamic, a real showperson," says Kendrick. "It's also a nod to the fact that even though we're moving ... and getting a bigger venue, we're not straying from that local music feel." In the past, the series has featured local artists mostly in the vein of indie rock with some folk. As the audience grows and the demographic expands from families who found the shows from Kendrick's blog (CJaneKendrick.com) to younger, more musically inclined crowds, bands have begun to approach them, to vie for a spot on the stage. "We always say to bands, 'Don't come to us, we'll come to you." If you're right for Rooftop, we'll know," says Kendrick. The series usually starts in May, just after the local universities' semesters end, to kick off summer. The start is delayed this year, as Kendrick and her team work out the details involved with the new stage and venue. "We were so overwhelmed with the idea of having to design a whole new stage for the show," says Kendrick. Provo Mayor John Curtis suggested that Rooftop organizers could buy themselves some time by dropping the first and last concerts of the series in order to see if the new model works. Kendrick is unsure whether or not they'll return to the ambitious six-show summer. The June lineup was announced in May, and each month's bands will be announced at the concert previous. "We thought we would try ... to have an ongoing narrative, to be able to focus on this concert, and then have another big announcement for the next concert," says Kendrick. Local bands Quiet House and Sego complete the June 5 lineup. The drag superstar brings her music (and larger-than-life persona) to Saltytown.